ASICS America provided me a code for one reader to win a complimentary pair of limited shoes for the giveaway. Hello friends! I have an amazing giveaway for you thanks to my ASICS NYC Marathon blogger challenge partnership! . Up for grabs, a pair of limited edition ASICS Gel Kayano® 21 NYC Marathon shoes! 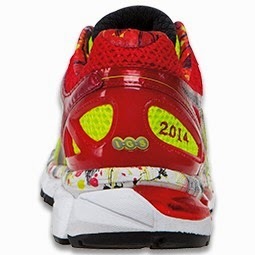 The beautiful ASICS Gel Kayano® 21 are valued at $160 and were made specifically for the 2014 TCS New York City Marathon. The 2013 NYC Marathon was my first ever full and I am honored to be part of #teamasics for the 2014 race. I remember going to the expo last year and seeing the ASICS NYC shoes and regret not buying a pair to commemorate my first full marathon. The shoe was updated with nothing but the best in ASICS technical innovation, featuring the next generation of FluidRide™ and an Ortholite X-40 sockliner for the lightest and most luxuriously stable ride yet. Mild to moderate overpronators will run in secure comfort, thanks to the new uniquely designed FluidFit™ upper and Heel Clutching System™. So you want to win a pair of these shoes? Not only was the 2013 NYC Marathon my first full marathon, it was also my favorite race to date. Let me know in a comment below what your favorite race was. Be sure to log your entries in the rafflecopter widget (and for a chance for a few more entries). Be sure to check out my fellow #teamasics friends for another chance to win a pair of Asics Gel Nimbus 21! I looove my Asics Nimbus and these are so pretty. My favorite race was the Ironman New Orleans 70.3. Not because it was a fast finish, but because I trained hard and accomplished something I never thought possible. My favorite race has got to be Rock N Roll Savannah Half. Great crowds, great support and a fun getaway. My favorite race is the Gate River Run, it's a fun race with lots of local support. I also love the NYC Kayano's. I am a Kayano runner & hope to add these to my collection..:) Good luck in NYC this year!! probably my first half marathon, zooma cape cod! I've worn those Asics for years! I love them. I heard they were the #1 shoe worn in Kona. I started wearing them to train for my first 1/2 in 2008, the Daytona Beach Inaugural 1/2. There is nothing more rewarding that training for something you weren't sure you could do and then seeing that finish line! I hope to do a full marathon in 2015! My favorite race so far has been the Glass Slipper as I enjoyed my #girlsweekend. I am excited to do my first full marathon this year at Disney! My all time favorite race has got to be the Crescent City Classic 10k in New Orleans, then a close second is the Double Bridge 15k in Pensacola Beach FL. Love them. My favorite race hands down is the Classic Marathon in Athens, Greece, where the marathon all began. It was surreal to run the same route as the ancient Greek soldier did to announce the Greek victory over the Persians. Then, to cross the finish line in the original Olympic stadium was amazing! My favorite race was Epcot's Wine and Dine half marathon! I started training for half marathons just so I could do this race. My husband's first marathon was New York in 2009, we ran together so that was one of my favorites! I think my favorite race was the Enchanted 10K this year. Ran with my BRF and just had a blast! My favorite race 2012 DL Half when I ran and finished with my 14 yo daughter! I just completed the Chicago Marathon and it is by far the best race I have ever done!! My favorite race was Rock and Roll 1/2 marathon in St. Louis in 2013, my 1/2 PR. My favorite races were the Detroit Half Marathon - because it was my first and I ran with my mom, and the Carlsbad Half last January because I felt great and pr'd. I'm running the Asics LA Marathon in March as my first full. I hope it ranks as a top favorite too! The one I just did. A 5k but for families who have lost babies....so worth it! I've run a couple handfuls of marathons but my favorite race is a local 5K I run with my kids on New Year's Eve every year. The event starts at 11:45 and we run through midnight. Some of the locals in the area set off fireworks during the event. The NY marathon will be my first full. But I've run the Steamboat half the most out of any other-- despite no bling-- because I can walk to the shuttle! The Princess Half has been my favorite race so far. It was my first half ans so much fun! Those Kayanos are BEAUTIFUL! My favorite race is the Bighorn Mountain Trail Race in Wyoming! I ran the 30K this winter and it was amazing! I am a newbie runner, but ran a local 10 k last week. The weather was gorgeous and the leaves were beautiful! I will run it again next year. Maybe one of these years, I'll be able to do the NYC marathon? I have never run in a race. I just doing daily running with my dog. My favorite was the Princess Half marathon. I've never done a race. I've been running for a month and want to do a 5k soon. My favorite race was my first marathon, NYC marathon in 2013. It was the first and last time my mother saw me accomplish something so great before she passed away a month later.